using computers to set up a meeting with a child for the purpose of abusing the child. the offence of violating a person’s privacy by capturing and sharing pictures or videos of a person’s private area without his consent. the offence of harassment through the use of electronic means with the intent to cause emotional distress. criminalising the act of sending multiple electronic mail messages that are unsolicited and which causes harm to a person or damage to a computer. The Bill lapsed with the end of the Parliament session on July 30 2014. Trinidad & Tobago Parliament website on the Cybercrime Bill 2014 which has the Hansard of the Parliament deliberations. smarTT comprises five (5) thematic areas, nineteen (19) key imperatives, and fifty-six (56) programmes, along with accompanying high level activities. The submission of comments was June 3 2013 but this deadline was extended to Tuesday 09 July 2013. Groups and lists are in alphabetical order. Please note, the Trinidad and Tobago Computer Society (TTCS) is not responsible for the content of third party websites/mailing lists/forums, etc. Links are for information purposes only. “Computing” is maintained by OPUS NETWORX and provides a place for general computing discussion with relation to Trinidad and Tobago. We welcome your participation and hope that you do find some interesting and hopefully provoking content on the list. As always we do ask that you remember and consider the concerns of the other people on the list and respect everyone’s right to air views, but recognise everyone’s right to your respect”. This is an email-only list. To subscribe: Send email to: [email protected] with the word JOIN in the message body. To unsubscribe: Send email to [email protected] with the word LEAVE in the message body. This is a 2 way list (if one person sends mail to the list, everyone subscribed to the list receives it). The mailing list is free to the public. A list of computer suppliers in Trinidad & Tobago in alphabetical order. Suggestions welcomed. financial loss, damage to your equipment, loss of data that may result directly or indirectly from such use. This page has not been endorsed in any way by any of these entities. Information on this page is subject to change without further notice. The TTCS is not affiliated with any of the companies or individuals listed on this page. If you have a complaint or problem with the companies or individuals listed on this page contact them directly. TTCS cannot help/will not intervene in any matter between You (the consumer) and the vendor. Diamond Systems and Supplies Ltd. Here is a collection of software I always store on a USB drive or burn on a CD before going to troubleshoot a home user’s Windows PC which is typically running Windows XP/Vista/7/8. Usually, the problem is due to spyware and/or virus infection and rarely problems with the hardware. On the flash drive are folders for each step I take (Step 1, Step 2, Step 3, etc) ; each folder contains the software I need to accomplish the step. This is a historical record of the Bulletin Board Systems (BBSes) which were in operation in Trinidad and Tobago between 1986 and 2000. A BBS was a computer system that allowed users to connect to the system (typically via dial up modems). Users logged in could chat, email, download files, post messages in forums for other users to read and respond to. BBSes were a precursor to what many persons do on the Internet today, social networking, downloading files, chat, reading and posting in forums or on email lists. Bulletin Board Systems (BBSs) in Trinidad and Tobago were a popular means of communications beginning in the late 1980s even though personal computers were expensive and few persons actually had one at home. That scenario began to change by the early 1990s as prices on computer hardware began to decrease and modem speeds increased. The Ministry of Science, Technology and Tertiary Education (MSTE) and iGovTT launched a series of consultations on the National Information and Communication Technology (ICT) Plan 2014-2018 on Wednesday 21 March 2012 at the Hyatt Regency Hotel which culminated in a two-day Conference on July 11 2012 as the final point of consultation on the Draft National ICT Plan. 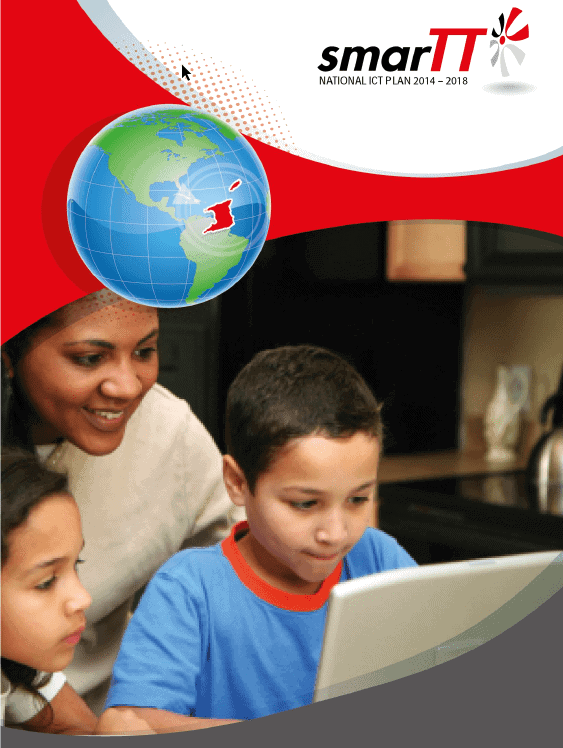 The Trinidad and Tobago Computer Society (TTCS) also submitted comments to the National ICT Consultation. Jacqueline Morris also managed to do a ustream live webcast during the first day of the July 11 2012 conference. The Trinidad and Tobago Computer Society has a discussion list where members where can discuss computer / phone / telecommunications related topics and other TTCS matters/activities. It’s a great way to find other people who are interested in the same kinds of technology topics as you are, and to find other viewpoints you may not have considered before. Our discussion list is a two-way list (if one person sends mail to the list, everyone signed up to the list receives it). This mailing list is a place for the members of the Trinidad and Tobago Computer Society (TTCS) to have respectful dialogue about ICT matters that are of interest to the community. 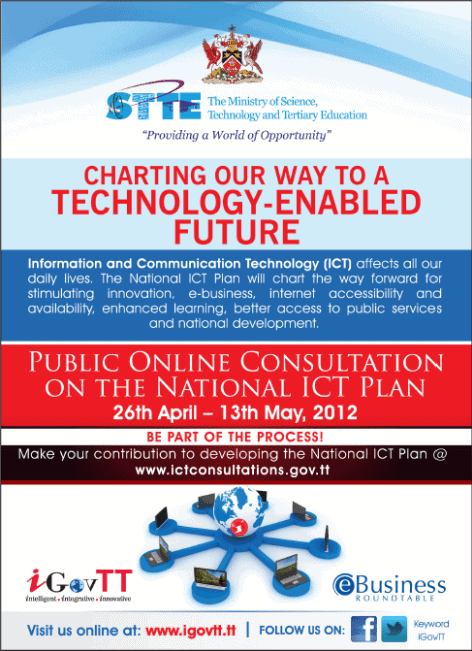 We want this list to be a fun and relaxing place to discuss ICT related issues, to share and to learn. Any member contacts the admins regarding any post they find offensive. If you find any post to be objectionable, please contact [email protected], or [email protected], including a copy of the objectionable email and your reasons for objection.